A Fiesty Frugal & Fabulous Giveaway for Valentine’s Day! The site is the brainchild of a stay at home mom..Tenille. (I even love her name!) I can only say, in this day and age, to be a stay at home mom, you need all the giveaways and coupons you can get your hands on! That’s what she does, she searches for these and brings them together into a web site for her readers to sign up for her special giveaways! Read below for a great Valentine’s Day giveaway for yourself! Pearl Paradise – Treat Yourself for Valentines Day! This past holiday season, many moms who read blogs for the latest news and info on products were introduced to PearlParadise.com The company did a fantastic job showcasing their products to many influential bloggers and giving readers the opportunity to win jewelry for themselves. To read more and see pictures of this great giveaway – Click Here to go to Fiesty Frugal and Fabulous! Presently I have their Eggshell Georgian Patterns up for bid on eBay – Cashmere and Countess. These patterns are very similar to each other and sometimes will fool even the most ardent collector if mixed together in a lot, which they usually are. I’m really pleased to introduce a new subject today. It’s not in the glassware category, but nonetheless, a very highly collectible item! Pewter is a favorite choice of many. The reason, so many items were made of pewter during the earlier Centuries, it was a highly prized metal as gold and silver are today. I would like to focus today on one company, Crescent Silverware Company in Jarvis, New York. This was one of the premiere Pewter makers in the US during the 1920s-1940s. They did manufacture Silverware items as well as Pewter, mostly holloware. Their Pewter items were a ‘coated’ Pewter that helped to bring out the lustre of the pewter and protect the pewter. They operated in Port Jarvis, New York , eventually becoming Kirk & Sons Silverware. A company you would be more familiar with that produced silverware. The backstamp for Crescent was a crescent moon and the words Crescent Pewter. It is important to note, all pewter items made in the 20th Century will have the word Pewter stamped on it. One reason pewter is not as highly collectible as other items, it is a very soft metal. Most of the older items does get dented, scratched or marked in some way. Most collectors realize this and often when you see older items listed for sale, they are accepted with dents and dings. To simply discard these lovely Art Deco works of art due to a simple dent would be a shame. Collectors simply purchase and restore. Quite frequently, we will find collectors who specialize in certain areas of pewter collecting. I’ve seen collectors of period candlesticks, figurines, plates, etc. At present, I have a pair of Crescent Pewter Candelabras up for bid on eBay. They are a matched pair and are 3 tier. They have been lovingly used, meaning there is some damage to them. Overall, they are usable as is, but they do need work to be restored to their original state. These would look so great in a collection. They are Art Deco in line and shape. They would also be great in a period decor. 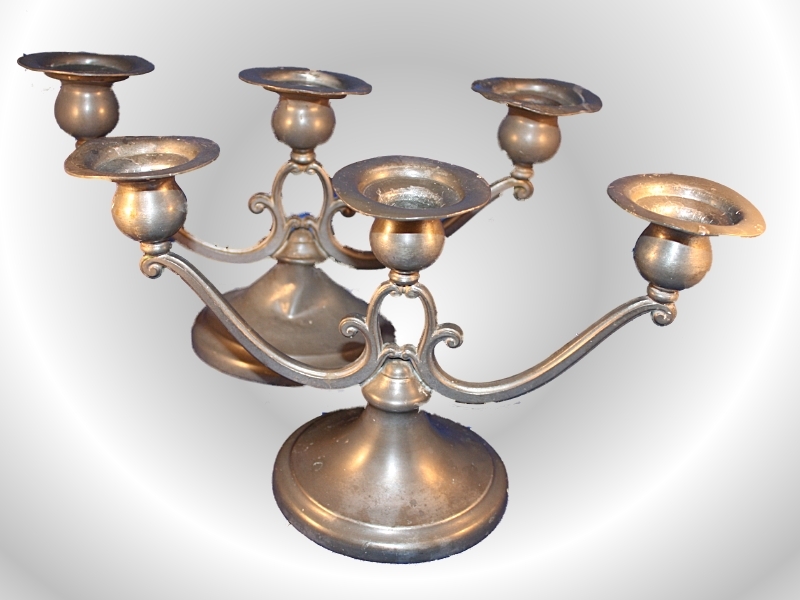 Please take a look at the auction by clicking here: Antique Crescent Pewter 3 Tier Candelabra Set of 2 . Please read more about this often overlooked and under appreciated metal on Wikipedia. Pewter collecting is a great way to start a collection that will hold its value for years to come! Department 56 Halloween Decor – Get Yours Today! It’s not too late to add to your Halloween decorations with the wonderful Department 56 Halloween Village Collection. As as collectibles, these go to the top of the list, even surpassing the Christmas Village in some cases. They are fun to collect and make a really great looking display for the kids (and the kids at heart!) during Halloween season. I have assembled in my store, ‘The Great Pumpkin‘ , a great selection of Department 56 Village and other items for your Halloween decor. There are the Village houses and accessories, ornaments, lights, yard ornaments and porch decorations. There is even a fog machine! All are discounted, most up to 25% of retail price! Also, enjoy Free Shipping when your order is $25.00 or more. What a bargain..especially with today’s gas prices! Please go in and browse, take a look around. When you find something you like, click on the item to add it to your cart. When you are through shopping, click on Proceed to Checkout. This will redirect you to Amazon for a secure checkout. Shipping will be from Amazon warehouse with their fast shipping. and is already showing signs of becoming a Bestseller on Amazon’s list of Bestsellers! It is released in paperback and Kindle formats. Right now, the Kindle price is 1¢….Kindle users, why are you still reading this?!.. head on over to Amazon for the download! In 1946, soon-to-be-executed Nazi General Hermann Goering asks young Soul Identity overseer Archibald Morgan to take his looted gold and deposit it in a soul line collection, there to await his soul’s rebirth. Flora, a seventeen-year-old Gypsy girl whose father died in the Dachau concentration camp, is sure that Goering stole the gold. She struggles to persuade Morgan to reject the Nazi’s deposit, but Morgan prevails. Sixty-four years have passed. A repentant Morgan opens Goering’s collection and discovers the gold is gone. In its place lies a cryptic journal. Morgan asks security expert Scott Waverly to find the thief and recover the gold. Scott must race through Europe to uncover the elusive secrets of what really happened in Nuremberg… secrets that threaten to reopen old wounds, settle old scores, and lead to the gold’s—and his own soul’s—recovery. A little about Dennis Batchelder, the author of Soul Intent. This information is taken from his Amazon.com web page. Dennis Batchelder is a computer security architect. He lives with his family in Bellevue, Washington, and spends his off-hours working on the next Soul Identity novel. If you are a fan of Dennis Batchelder and his books, please take the time to comment on this post. I will be passing along the info to Dennis. I’m sure he might pop in from time to time to answer your questions! I also hope to add his web site links to this blog for his fans. Thank You For Your Visit And Comments! Shamelessly Promoting Bestselling Amazon Authors and Their Books! Anyone who has been around me knows, I am an addict when it comes to books. Don’t get between me and a good book, it could get very dangerous! This addiction started when I was quite young and continues today, (I hate to say it but..) almost a 1/2 Century later. Although I was a very good student in school, I really wasn’t that bright. I could remember what I read and comphrehend the meaning. This combination has been the real secret to my success in life. On to the other love of my life, browsing the Internet for absolutely useless tidbits of information. If you ever want to play a trivia game, just call me…I’m the partner you need. I never lose at Trivia games. I’m forever picking up all those little tidbits that everyone else just takes for granted. I’m also the one who sends them to you fills your email box with these interesting facts you discard before reading because you actually have real work to do! One night, while combining my two interests, browsing Amazon books! Whoa..Nirvanaville for me… I have lost a small fortune on Amazon. In the wee hours of the morning, buying books of all sorts to read, even though I just bought about 10 from Borders because I had the coupon. I just had to buy them, they were ‘on sale’! This day while browsing I found a very interesting site. It was a forum of authors who had formed the group to ‘Shamelessly Promote’ their books. I had to stop and take a look at the postings. I was absolutely enthralled! Being an avid reader, listening to the author talking about their books and how the why they created the characters, the thoughts behind the story line, really brought these books to life! I had not heard of some of the authors before, but I found some now that write in my area of interest, I cannot wait to get a copy of their books! I feel so moved by this group, I asked if I could write about them, their books and let others in on this fabulous group. All of these authors are so genuinely appreciative of their fans and what their fans want, I suggested putting together a page where I could show the authors and their books. I plan to set up an authors corner where the author can come and talk about their book and answer their fans questions and comments. We will start with one book at a time for each author and spotlight on them for the post. Make sure and bookmark this blog and come back often to see if your favorite author is being spotlighted. New Page Mage an Interactive eBay Listing Tool! These OSI Rock Stars choose Success! To learn more, visit their blog sites! NEED TO SAVE MONEY ON ADVERTISING? Like what you see? Help me Share with Friends!